Weston-super-Mare, the surrounding area and Locking in particular, have a long association with aircraft and flying. In 1910, just 7 years after the Wright brothers first flew, a celebrity airman and showman Sam Cody gave a lecture in Weston's pier pavilion about flying and how it could encourage tourists which was well received. On 3rd August 1911 he became the first man to arrive at Weston by aeroplane landing on the beach. 7,000 people flocked to Weston's sea front to see him and his new-fangled flying machine. The local community soon realised this new potential for attracting visitors and by August 1912 floatplane flights from Sand Bay attracted considerable publicity. The first flight by pilot Mr Hucks across the Bristol Channel to Cardiff and back took 40 munites. The 1st World War stopped all civil flying but led to the rapid development of aeroplanes which became more reliable, safer and able to carry one or more passengers. 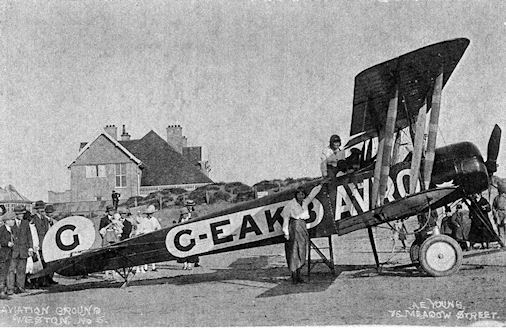 By August 1919 passenger flights were taking place from the 'Sands' aerodrome off the beach near Uphill and The Warwick Aeroplane company offered flights from Brean Down. Avro bi-planes gave joyrides to passengers during short flights along the coast, and visitors queued to take the glamourous adventure of flying and have their photograph taken. In one week in September 1919, Avro flew 161 passengers in 81 flights in a 3-seater aeroplane. During the 1920s various companies offered flights in the summer months from the beach front. In August 1920 Henri Barman landed his seaplane opposite the Grand Atlantic Hotel. Care had to be taken on the state of the tide. By the 1930's spectacular flying displays were provided by shows like Cobham's Flying Circus, and airline operators started to offer scheduled flights. Weston had to provide more permanent facilities with a passenger terminal, hangars and runway on which aircraft could take-of and land throughout the year. In 1933 Weston had an airport committee to look at building an airport. A flat area of land on Locking Moor near West End Farm was selected and by 1935 the council funded the £56,000 land and construction costs. Western Airways was selected to manage the airport, and construction started in February 1936. Money was spared by making use of a former 1st World War field hospital wooden building for the passenger terminal, and the top of the control tower was a wooden taxi shelter from the sea front. To encourage visitors the terminal building included a waiting hall, booking office, bar and restaurant plus a Verandah Cafe. By 25th May 1936 the first scheduled service from the grass runway on the new airport started. The service across the water to Cardiff proved very popular with return trips for 12 shillings (60p) in Western Airway's Dragon, Dragon Rapide and Puss Moth aircraft. The flights were only short but by far the quickest way to travel as there were no road bridges then across to South Wales and the only alternative were steamers from Weston pier. The Cardiff shuttle service was particualry popular on Sundays when Welsh pubs were closed! Services were soon expanded to Bristol, Birmingham, London Croydon and Bournemouth from where there were flights on to Paris. In the first two years of operation 30,000 passengers had flown from Weston airport making it one of the busiest in the country. As well as passengers, strawberries grown locally around Cheddar were transported to market in Cardiff and Birmingham. A flying club taught people to fly for £2 5s (£2.25) an hour, and the hangar was used as an aircraft overhaul and repair facility. In 1939 with the advent of the 2nd World War, all civil flying stopped and the airfield was taken over for military use. The Civilian Repair Organisation (CRO) arrived and contracted Western Airways to inspect, repair, overhaul and modify military aeroplanes. It was never an operational base but a wide variety of different aircraft types used the airfield. A pilots block and a new 1200 yard long concrete runway were built to handle larger aircraft. RAF Locking to the North of Locking was opened as a training camp providing training including flight mechanics, airframes, engines, parachute training and air gunnery to meet the requirements of the RAF. Thousands of aircraft and later radio technicians were trained at Locking to meet the requirments of the RAF. By 1944 the school had trained 30,682 tradesmen for the RAF and Fleet Air Arm. Anson, and later Varsity, aircraft were stationed at the airfield to provide air experience and navigation training. 'Shadow' aircraft factories were built on the West side of the airfield at Oldmixon, and to the South East of Locking at Elborough near Banwell, where the Bristol Aeroplane Company manufactured Bristol Beaufighters and other aircraft. Shadow Factories were dispersed away from city centres so that if cities wers bombed production could continue. 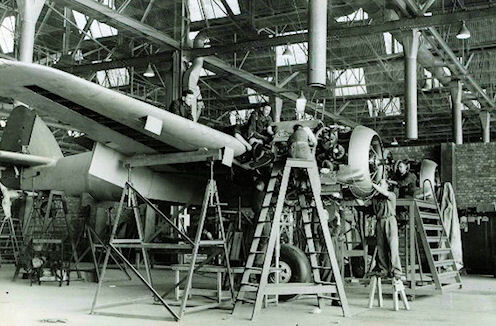 3,335 Bristol Beaufighter aircraft were built at the Weston factories. The main road past Locking was widened and staightened so that completed aircraft could be towed to the airfield for flight test and delivery. A secret Aircraft Torpedo Developement Unit (ATDU) was based at the airfield and flew up and down the Bristol Channel testing weapons. Civil flying restarted in 1946 with the passenger service to Cardiff, however it became increasingly difficult to make it profitable and it soon ceased. Western Airways concentrated on aircraft maintenance, and aircraft including Bristol Freighters and Bristol Britannias arrived for update and maintenance. The Varsity Flight continued to provide air training for students from RAF Locking. In the 1950's the Oldmixon factory and flight sheds on the airfield became the Helicopter Division of the Bristol Aeroplane Company starting a long association of helicopters at Weston. Under chief designer Raoul Hafner they designed, developed and manufactured the Bristol Sycamore and tandem rotor Bristol Belvedere which were among the most advanced helicopters of their time. 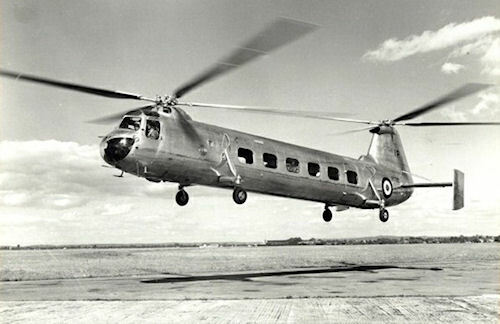 In 1960 Westland Helicopters took over, and the manufacture sub-assemblies and modification of helicopters provided work for 1600 people becoming the largest employer in Weston. The Oldmixon factory closed in 2003 when Westland moved all work back to Yeovil. The factory at Elborough became Bristol AeroJet and maunfactured missile motors during the Cold War. These included rocket motors and casings for Bloodhound, Sea Cat and Rapier missiles. In 1967 The Achilles School of Flying based at the airfield offered single and twin engined instruction, instrument ratings and charter work and took over the pleasure flying operations. The installation of runway lights and a radio beacon in 1968 attracted Imperial Tobacco who based their flying operations at Weston, as did a number of others, such as Bristol Air Taxis, who had their maintenance carried out by Western Airways. In the 1970's Avon Air Days were held at the airfield recreating the events of the pre-war air shows with spectacular flying and stunts. In 1972 there was a mid-air collision between two bi-planes which crashed on the airfield. Both pilots survived. 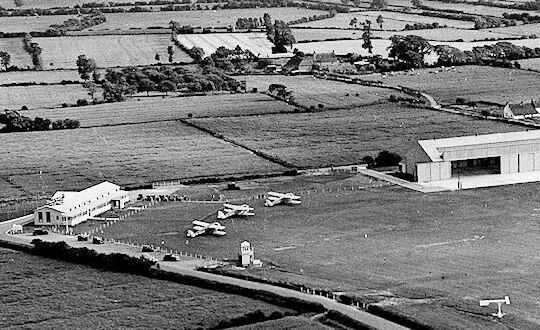 The RAF Volunteer Gliding School (621), the Woodspring Gliding Club and later the Mendip Gliding club operated from the North side of the airfield until 1995. Since then the only aircraft flying from the airfield are helicopters visiting The Helicopter Museum. The Helicopter Museum established in 1989 on the airfield is the world's largest museum dedicated to helicopters and has over 80 aircraft on display. 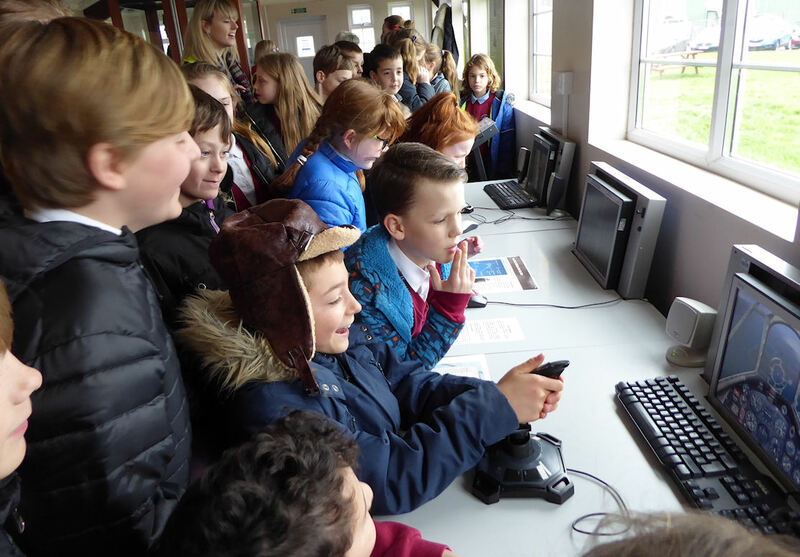 The airfield's original 1936 control tower, and 1940's pilots block have recently been restored with a Weston Avation exhibition about the history of aviation around Weston, RAF Locking and the airfield. A Bloodhound missile stands guard outside. 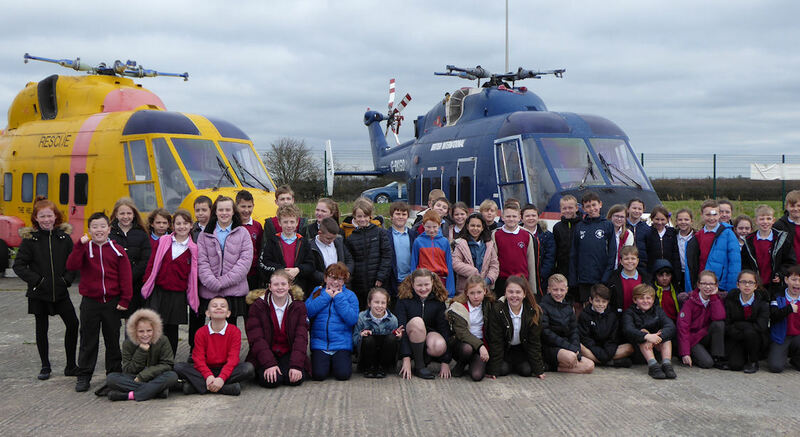 120 pupils from Locking School visited the Helicopter Museum in March 2019 as part of the Heritage Project. They were shown the helicopters in museum hangars by museum guides and visited the Weston Aviation exhibition in the airfield pilots block.